The Piotroski F-score refers to an American professor named Joseph Piotroski. You can find more about the man and his formula can be found on his own wiki page. Piotroski uses a series of strict selection criteria to identify top quality companies. In total the score tests 9 selection criteria, all of which can be found in the company’s annual and quarterly results. The nine criteria determine how strong the financial position of the company in question is. The higher the score, the better the company performs. The exact F-score (the “F” stands for “financially sound”) is a sum of nine individual criteria. Each individual criterion has a score of 0 or 1. The final score will always be somewhere between 0 and 9. Positive return on assets in the current year (1 point). Positive operating cash flow in the current year (1 point). Higher return on assets (ROA) in the current period compared to the ROA in the previous year (1 point). Lower ratio of long term debt to in the current period compared value in the previous year (1 point). Higher current ratio this year compared to the previous year (1 point). No new shares were issued in the last year (1 point). A higher gross margin compared to the previous year (1 point). A higher asset turnover ratio compared to the previous year (1 point). With the four first criteria, the company’s profit potential is examined. From point 5 to 7 the focus is on solvency (including debt). The last two criteria look at the operational efficiency of the company. Companies with a F score of 2 or lower are considered to be very weak. These may be even potential short candidates! Companies that score 8 or 9 are strong. Please note that the method is not applicable to insurers and banks. Piotroski applied these criteria to stocks which passed his “mother filter”. This basic filter was looking for low-price / book value shares (only the 20% lowest values were retained). However, the score also turned out useful in general, even without the filtering for low price / book values. Piotroski tested his theory on investment data from 1976 to 1996, concluding that inexpensive shares that get a F-score of more than eight, yield a return that is about 7.5% above the index’s index each year. Ok, 1996 is a long time ago but for a current state of affairs, you can always visit the site of the American Association of Individual Investors (AAII). Through this link you will get an overview of the results over the past year, past five and 10 years and since the F-score has been established. Did you know that the F-score was one of the rare methods that also produced a strong positive return in 2008? You probably will not be surprised that the number of candidates with a high F score (> 8) is quite rare! At the same time it is also the strength of the model. 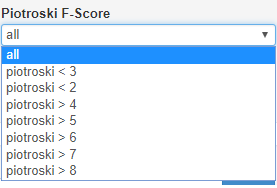 Normally, it is also a fairly intensive job to manually check companies for their F-score. With the addition In our screener, you can now read the F-score very quickly for each company and use it as a base or additional filter. The chartmill stockscreener allows you to find both low Piotroski scores (below 3) and high scores (from above 4) with a single filter. Find stocks with a Piotroski F-score of 8 or 9, having a price book value below 2 and a good chartmill valuation rating here. Note: A good chartmill valuation rating means the stock is priced cheap overall. You can find the full analysis of the score in the fundamental report. Do you want to use Chartmill without any limitation? An annual subscription costs less than $ 22 per month. This allows you to use our stockscreener completely unlimited, including all future updates! We shouldn’t really need to say this, but chartmill is a tool that helps you make your analysis. Your trading is your responsibility and nothing on this website should be interpreted as direct advice to buy and/or sell securities. If you have any questions or comments, please visit our contact page.